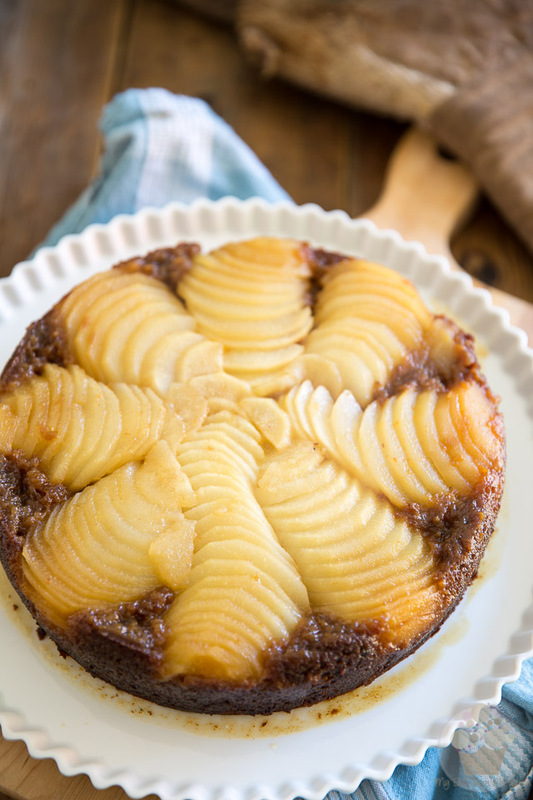 This Upside Down Spiced Pear Cake is the perfect dessert for Fall! 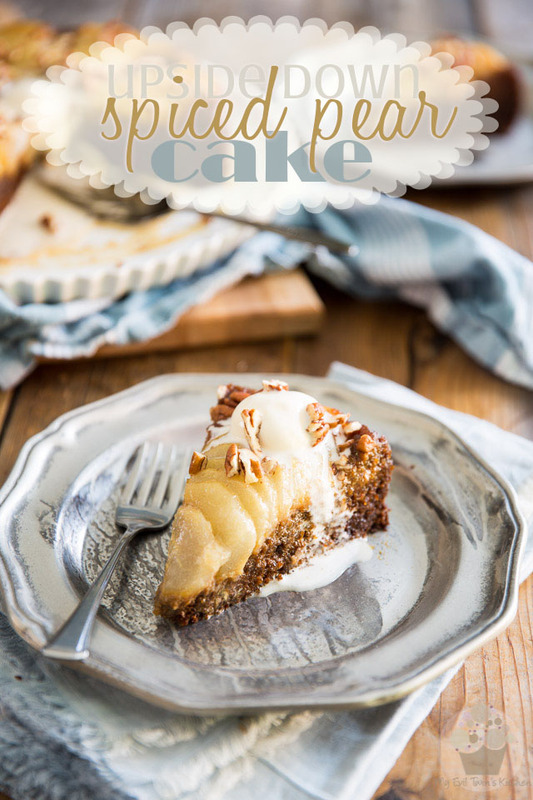 It’s sticky and sweet with an honest touch of molasses, cinnamon and spice! 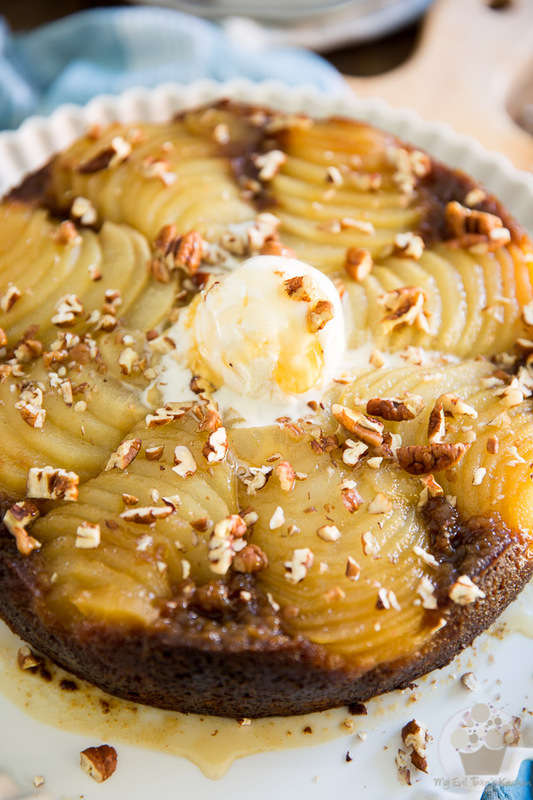 I came *this* close to not sharing this Upside Down Spiced Pear Cake recipe with you… I wasn’t super happy with my pictures, you see? But then, the cake turned out so friggin’ amazing, I just couldn’t keep the recipe to myself. 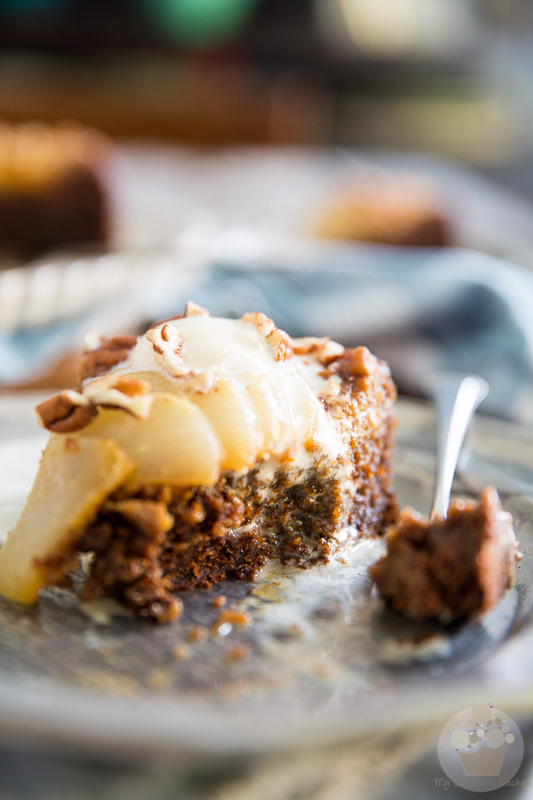 But let’s focus on this Spiced Pear Cake for now, shall we? 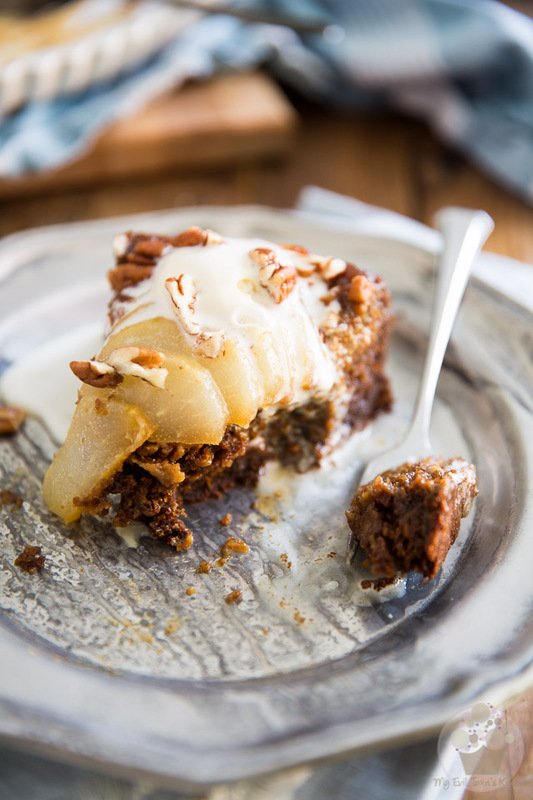 Served warm, it’s super ooey and gooey, soft and creamy, almost like a Christmas pudding. Cold, this cake reminded me of one of my favorite cookies when I was a kid: Bear Paws. It’s sticky and sweet with a very honest – in your face – molasses flavor, accompanied by all kinds of notes of cinnamon, spices and everything nice! 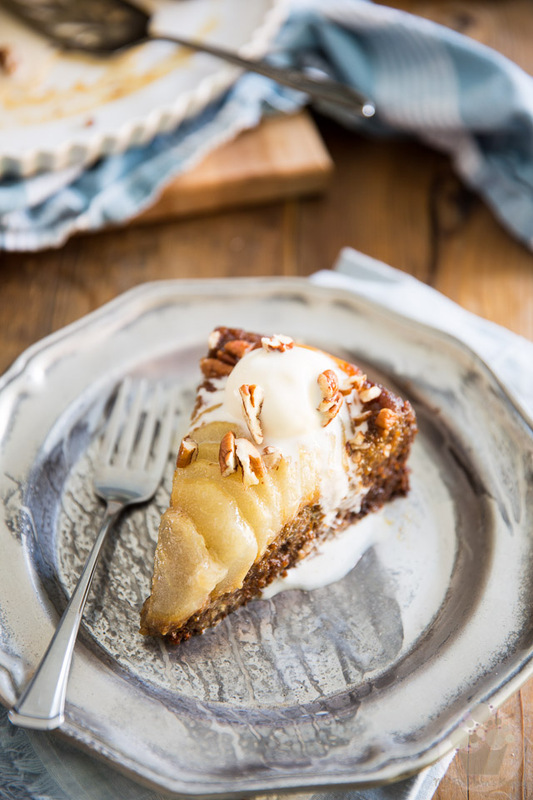 The pears, for their part, offer your taste buds a nice refreshing break from the overall sweetness of the cake, not to mention a fantastic contrast in texture. 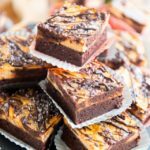 All in all, this is a very unpretentious dessert, fit for any occasion, that you’ll want to make over and over again. It’s particularly brilliant on a cold and rainy Autumn day — it’ll bring a little sunshine in your day, guaranteed! First and foremost, before you do anything, make sure that all your ingredients are at room temperature. Trust me on that one: if there is one rule that you absolutely MUST follow with this recipe, that would be it. Preheat the oven to 350°F and grease the bottom and sides of a 9″ springform pan. 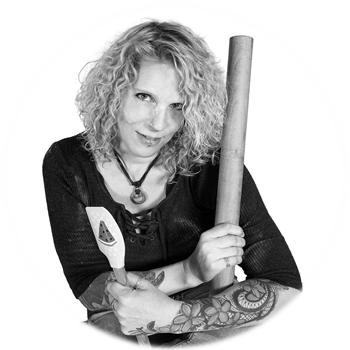 While it’s not absolutely mandatory that you use a springform pan, because you’re never actually going to remove the ring at any point, you want to make sure that you use a cake pan that’s at least 2½ inches deep. 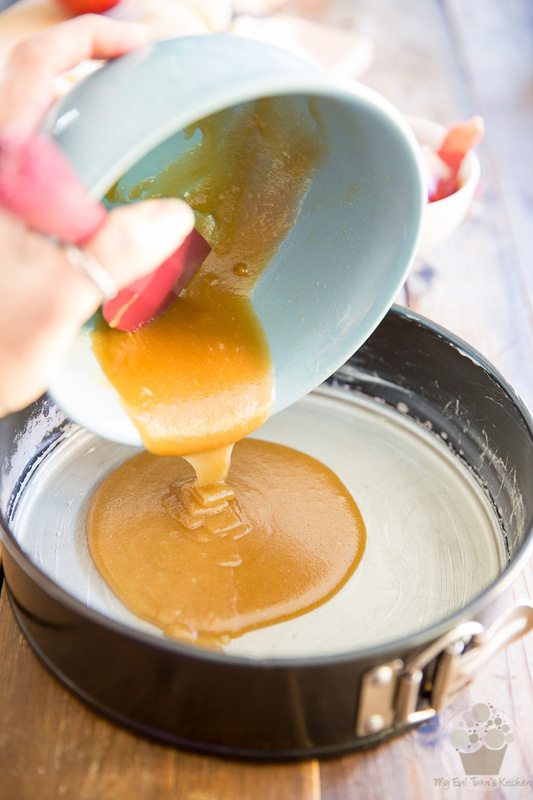 In a small mixing bowl, combine the melted butter and brown sugar; mix well and pour the mixture into the prepared pan. 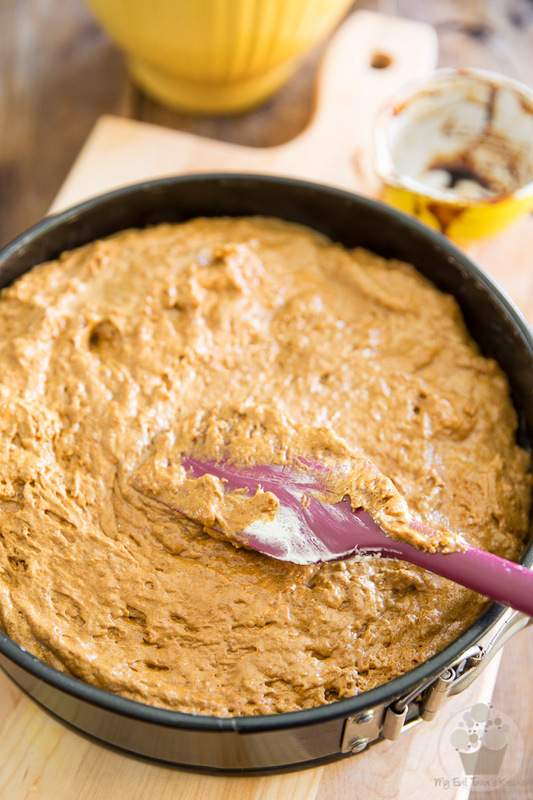 You’ll then want to tilt the pan a little from side to side to help the mixture spread all the way to the edge. 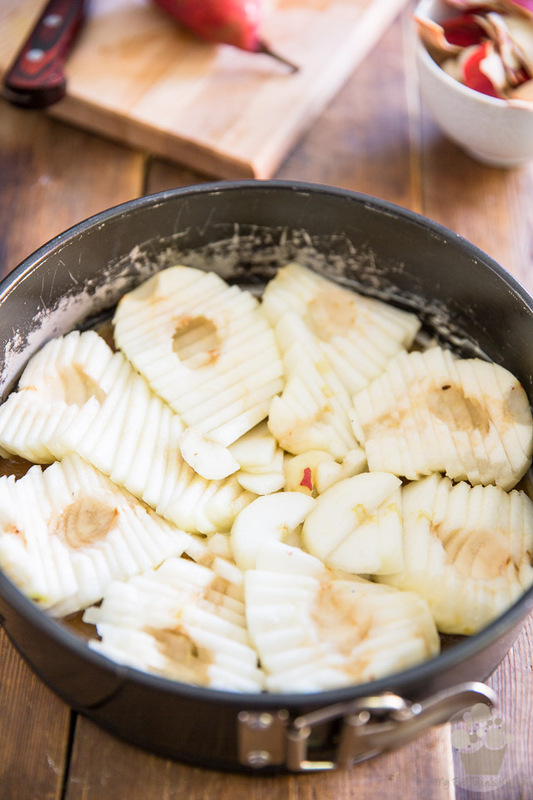 Next, arrange your sliced pears side-by-side over this brown sugar mixture, making sure that they cover the entire bottom of the pan. It doesn’t matter how you choose to arrange the pears, really. 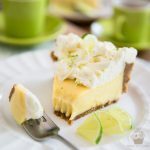 I sliced mine crosswise and positioned them so their pointy ends all faced towards the center, but you could very well slice them lengthwise instead and place them in a circular fashion, or create a spiral of some sort. 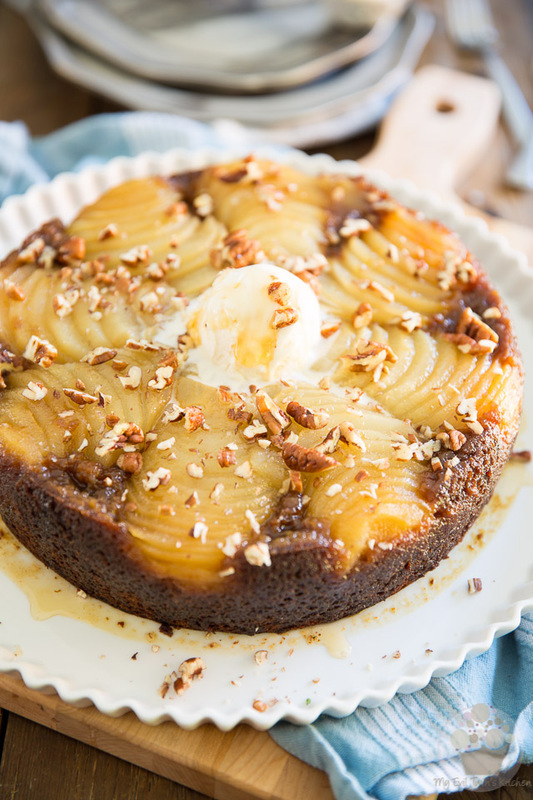 Just keep in mind that you will be flipping your cake over after it’s done baking, so make sure to arrange your pears in such a way that their best looking side is facing down. 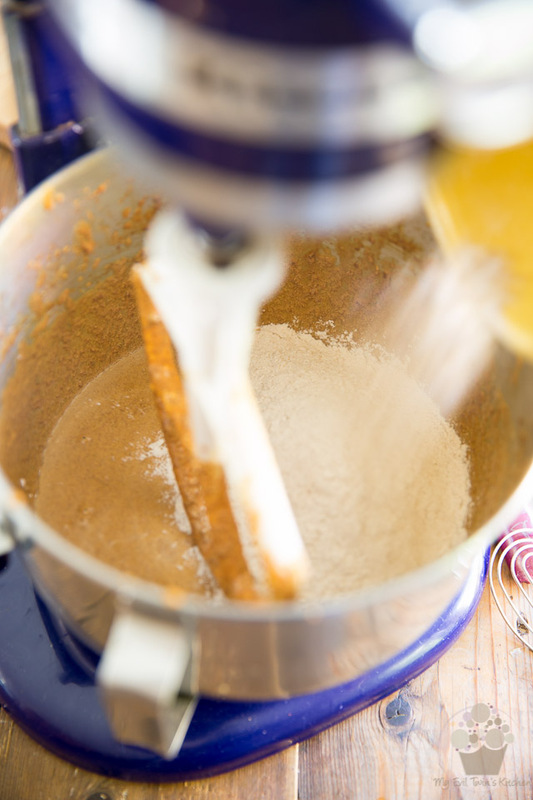 Start by combining all the dry ingredients in a large mixing bowl and mix them well with a whisk until they are airy and fully combined. Set aside. 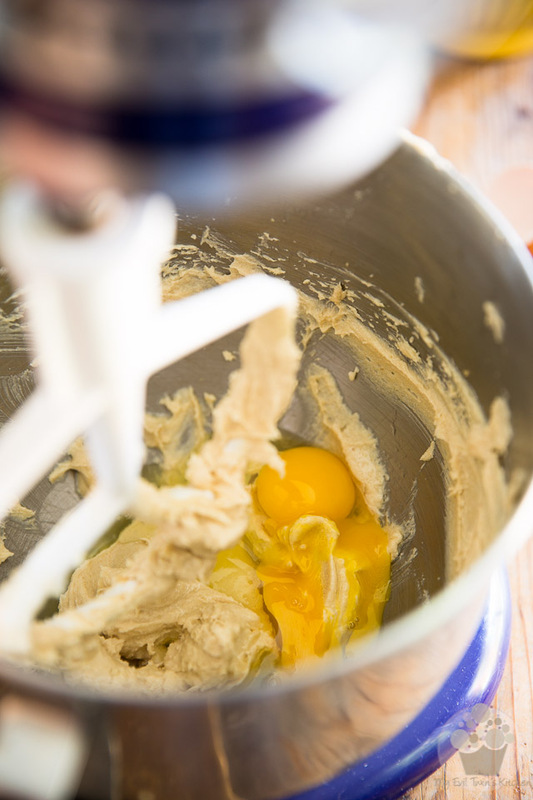 Then, in the bowl of your stand mixer equipped with the paddle attachment, beat the the butter and brown sugar on medium-high speed until light and fluffy, about 3 minutes. Stop the motor to scrape the sides as necessary. Add both eggs and beat again until pale and airy. Now incorporate the apple sauce and molasses and mix until well combined. If you’re wondering about the brown stuff that you see at the bottom of my bowl, that’s the applesauce that I used. While it wasn’t that exact same brand, it was very similar. The pink coloration comes from the peel which was left on the apples when they got cooked. Yummy stuff! But you could very well use the standard yellowish/white variety that we’re more accustomed to. It would work just as well! 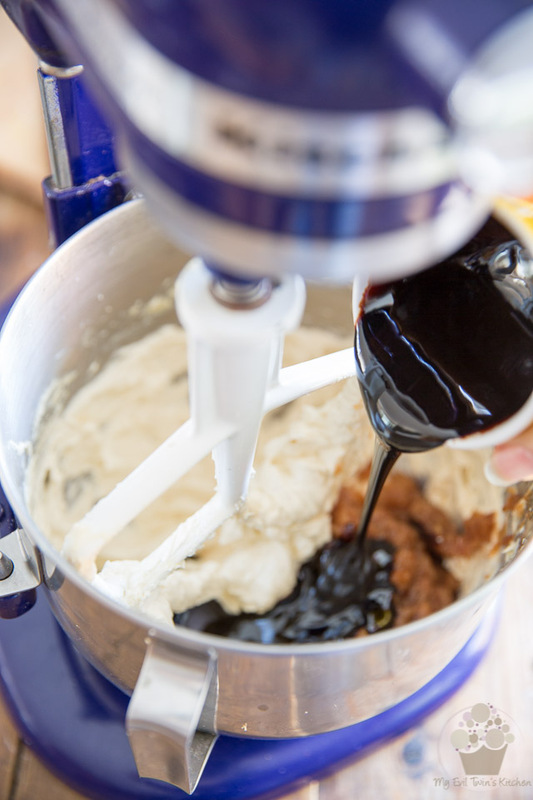 Once the molasses and applesauce have been integrated, add the dry ingredients and mix on low speed until just incorporated, no more. …and then delicately spread it all the way to the edge of the pan. Bake the cake for 60 minutes or until a toothpick inserted in the center comes out clean. … and flip it over onto a rimmed cake plate. Serve warm, garnished with vanilla ice cream, chopped nuts and a drizzle of liquid honey, if desired. 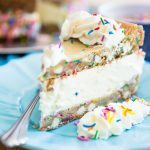 This cake is also delicious cold and leftovers will keep for several days in the refrigerator. Before you do anything, make sure that all your ingredients are at room temperature. 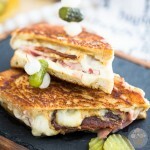 If there is one rule that you absolutely MUST follow with this recipe, that would be it. 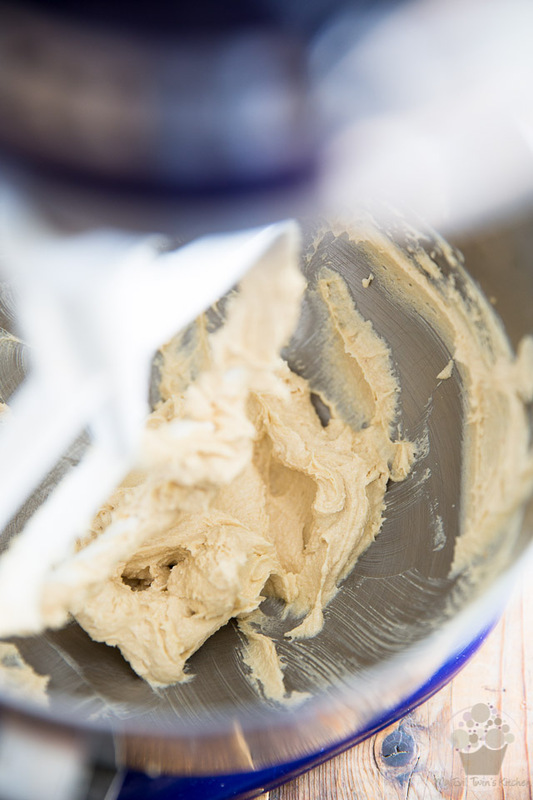 In the bowl of your stand mixer equipped with the paddle attachment, beat the the butter and brown sugar on medium-high speed until light and fluffy, about 3 minutes. Add the eggs and beat again until pale and airy. 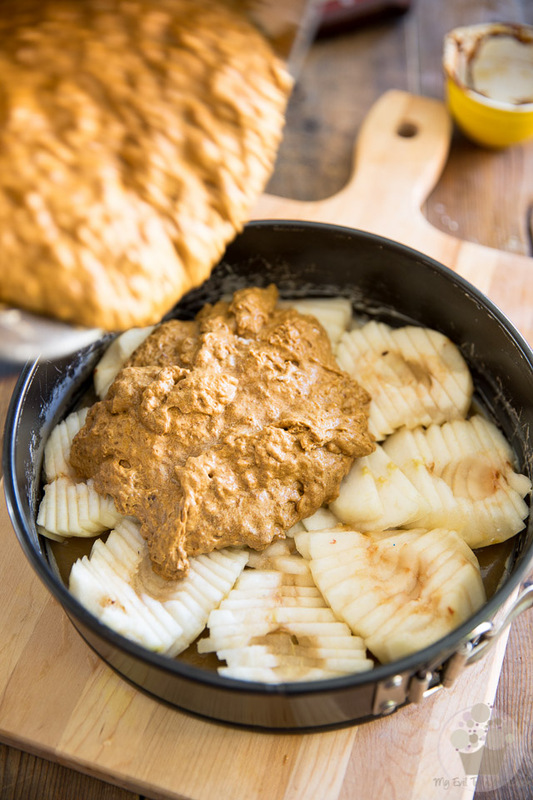 Incorporate the apple sauce and molasses, mix until well combined, and then add the dry ingredients and mix on low speed until just incorporated, no more. *It's not absolutely mandatory that you use a springform pan because you're never actually going to remove the ring. 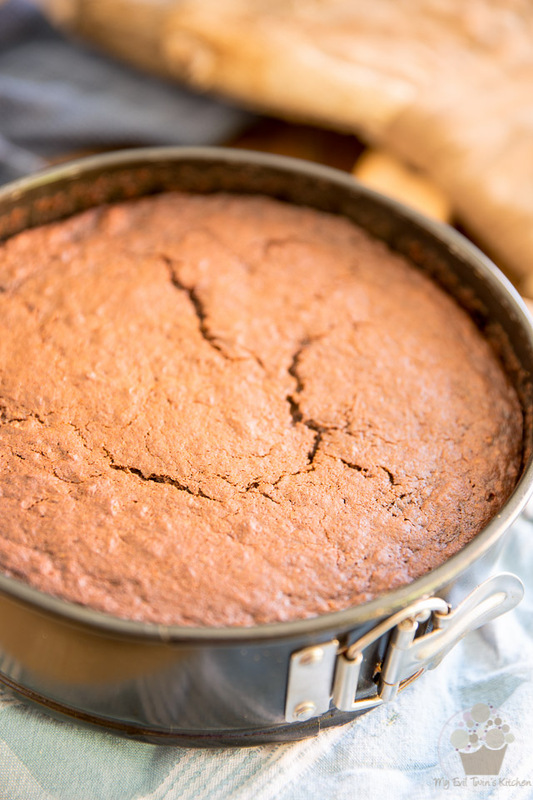 However, make sure that you use a cake pan that's at least 2½ inches deep. The light has been less than stellar inside the last few days..I know what you mean..don’t you find sometimes you make something delicious..like a mushroom soup;) And brown/ beige does not photo well..
then you have a really cute dessert that is so sweet..you can’t eat it? But it’s photogenic? Looks delicious.I love when the fruit decorate the top so beautifully. Hahaha, too true Monique. And I’m so with you about the light, it’s been hard to get any work done in the kitchen these past few weeks. Well, cooking isn’t really a problem, but taking pictures sure isn’t easy. It’s been so dark we’ve had to have the lights on even in the middle of the day! Thanks for your kind words, by the way. Coming from a photographer who’s as talented as you are, that comes as one huge compliment!